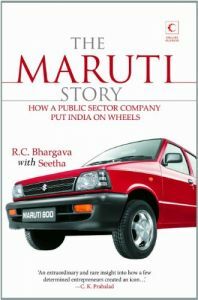 The Maruti Story: How A Public Sector Company Put India On Wheels looks into how Maruti Udyog Limited achieved one of the most difficult Indian goals of the 1980s. Established in 1981, this company was co-owned by the Government of India and the Japanese company Suzuki. The aim of this organization was to manufacture a car that would be affordable for middle-class Indians. This book gives a rare and meticulous insider's look into how Maruti successfully released its first car, the Maruti 800, in 1983. Since 1981, the company worked to get legal permissions and documentations. It also needed to build a factory, and have supply chain networks. It had to meet various parameters as it was a government owned public sector organization. On top of that, the management also had to ensure that the Japanese partner was kept in the loop. In 1983, Maruti revolutionized the automobile industry. For the first time in modern India, the common man could own a reliable and affordable four-wheeler. The Maruti 800 sold in large numbers, and became a huge hit. Maruti had empowered an entire nation. The Maruti Story: How A Public Sector Company Put India On Wheels speaks about how even after three decades, this company is still India's No.1 car manufacturer, inspite of having stiff competition from foreign manufacturers. Today, Maruti sells its cars all over the world. This book documents the incredible journey of Maruti, the skills of the managing body, the determination of the employees, and the willingness to aim for the impossible. R. C. Bhargava is the Chairman of Maruti Suzuki India Limited. He became an IAS officer in 1956, and was made BHEL's Commercial Director two decades later. He joined Maruti Udyog Limited in 1981, and was appointed as the Chairman of the Board in 1990. He retired in 1997, but was once again given the position of the Chairman in 2007. Bhargava is an advisor and consultant to many international corporations, and is a board member of various Indian organizations. He is also active in the Confederation of Indian Industry. In 2011, he was awarded the Order of the Rising Sun by Japan, and the Lifetime Achievement award by Economic Times. Seetha is an author, journalist, and contributing editor of The Telegraph. She has written The Backroom Brigade: How a Few Intrepid Entrepreneurs Brought The World To India. She has more than 25 years of experience in the publishing field. Her publications have been printed in Economic Times, Business World, The Times of India, DNA, and more.